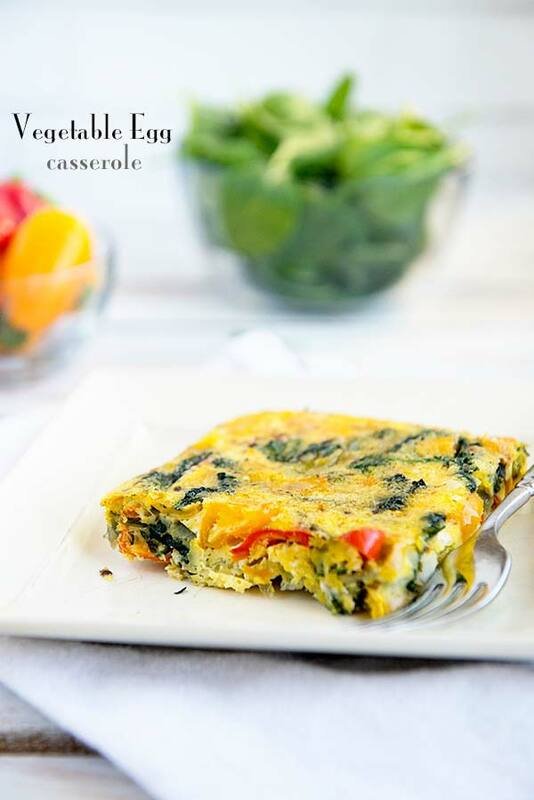 A healthy egg casserole recipe, packed full of veggies and protein! Ever since Weight Watchers changed their program to the new Freestyle program, eggs have been eaten like crazy in my house. Since eggs are now Zero SmartPoints on the new Freestyle program, I have been incorporating them more and more into my every day meals. 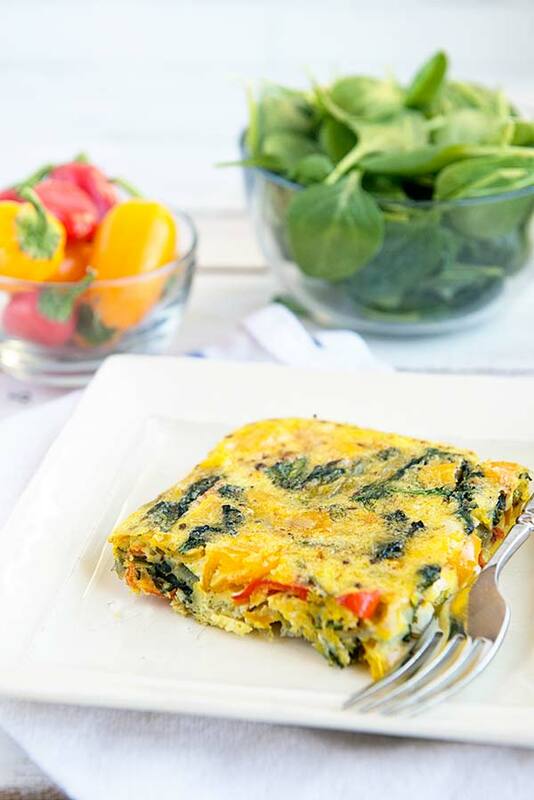 One of my favorite creations since this new program launched is this Healthy Egg Casserole recipe. Packed full of veggies and flavor, I just can’t get enough of it. The other day I had a group of local bloggers over who all happen to be on Weight Watchers too. I decided to share this healthy egg casserole with them because I knew it’d sustain us for breakfast and be something we could easily eat without going over our SmartPoints. The consensus was this simple casserole is so delicious, it’s hard to believe it’s only 1 smart point per serving. What I love about this casserole is it is so easy to make and it’s also one of those things you can cook ahead of time and then reheat when you are ready to eat it. It’s a great breakfast (or lunch) to have on hand when you need to grab something quick. For a variation (although it’ll add more smart points to the dish), throw in some grated Colby Jack cheese. 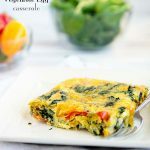 This healthy egg casserole recipe is really easy to adapt to the ingredients and flavors you want for breakfast. 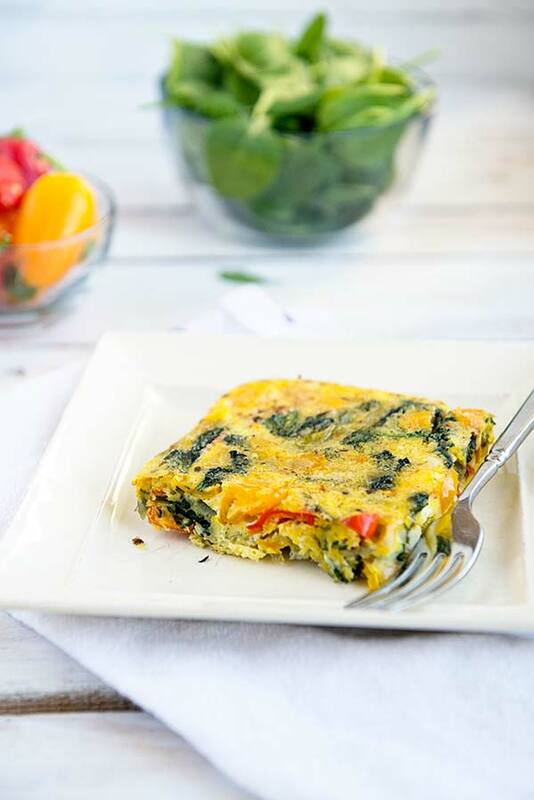 If you are looking for a quick to put together breakfast that won’t make you feel at all deprived, definitely add this healthy egg casserole to your morning meal plan. It’s the perfect, low smart point way, to start your day! Did you know I’m sharing my health and wellness journey on a new Instagram Account? You can follow me by clicking on DineandDishFreestyle. A healthy egg casserole recipe that's easy to make and only 1 Weight Watchers Smart Point per serving. Warm coconut oil over medium heat. Add garlic, peppers, onion and spinach. Sauté for 3-5 minutes, or until vegetables are somewhat tender (they will soften up completely while baking). Spray a square 8x8 casserole dish with non-stick cooking spray. Add the eggs, milk and seasoning to the casserole dish and whisk until light in color and fluffy. Stir in the sautéed vegetables until distributed evenly. Bake 20-25 minutes or until the eggs are set and cooked through. Remove from the oven and slice into 4 squares and serve. What a simple yet perfect treat ! Thank you so much ! What a yummy egg treat!!!. It’s amazing and lovable. I am going to surprise my hubby with this roll! Thank you for sharing the Egg Casserole Recipe it appears eggs are not the culprits that was once thought. Hey Kristen….! Amazing egg treat…. and it’s too healthy for our health and these looks soooo yummy, I will try to making this in upcoming weekend. Thanks for sharing most delicious dish……! Looks like a huge omelet, and really delicious! I’ll sure give it a try! Yum!! This looks perfect for meal prep. I love healthy breakfasts that I can make ahead! How many days is this good for? Would you put it in a freezer to keep longer? I’m terrible at freezing things so am not sure, but we will make a casserole on Monday and then eat it for breakfast during the week. I would say 4 days, refrigerated. I just looked and according to good old Google, an egg casserole can be frozen after baked then should be eaten within 2-3 months. I hope that helps!